Expertise: Eurasian states in transition; nation and state-building, US foreign policy, global emerging market risk. Bremmer created Wall Street's first global political risk index (GPRI). He is the founding chairman of the World Economic Forum’s Global Agenda Council on Geopolitical Risk and is an active public speaker. He has authored several books including the national bestsellers Every Nation for Itself: Winners and Losers in a G-Zero World and The End of the Free Market: Who Wins the War Between States and Corporations? Bremmer is a contributor to the Financial Times A-List and Reuters.com. He has written hundreds of articles for publications including The Wall Street Journal, The Washington Post, The New York Times, Newsweek, Harvard Business Review, and Foreign Affairs. He appears regularly on CNBC, Fox News Channel, Bloomberg Television, National Public Radio, the BBC, and other networks. Bremmer earned a PhD in political science from Stanford University in 1994 and was the youngest-ever national fellow at the Hoover Institution. He is a global research professor at New York University and has held faculty positions at Columbia University, the EastWest Institute, and the World Policy Institute. In 2007, Bremmer was named a Young Global Leader of the World Economic Forum. His analysis focuses on global macro political trends and emerging markets, which he defines as "those countries where politics matter at least as much as economics for market outcomes." Peace Studies Fellowship, Stanford University. Every Nation For Itself: Winners and Losers in a G-Zero World, Published by Portfolio (Penguin Group), 2012. A national bestseller, it was named "Book of the Year" by the Foreign Policy Association, and selected for the Financial Times' "Pick of the crop" list. The Fat Tail, written with Preston Keat, is published by Oxford University press on March 9, 2009. Management,Cambridge University Press, July/August 2008. “Timely, thoughtful, and written with verve and clarity, this is an impressive work of analysis and prescription,” — Strobe Talbott. Reviewed by Andrew Engel, on February 7, 2008. The cover interview for SFO Magazine, June 26, 2009. A full page interview in O Estado de Sao Paulo about state capitalism, June 22, 2009. “The Call: US and China on a collision course,” Foreign Policy, June 4, 2009. “Government Intervention and Political Risk,” Real Clear Politics, June 3, 2009. “Iran's Upcoming Election Could Help Break Diplomatic Stalemate With U.S.,” realclearpolitics.com, May 27, 2009. “Call: Economic Recovery but Political Gridlock in Japan,” Foreignpolicy.com, May 20, 2009. IAN BREMMER was interviewed about global risk in Fortune magazine by Patricia Sellers, Fortune Editor at large, May 14, 2009. IAN BREMMER was quoted by George F. Will in “Capitalism goes out of Tune,” Washingtonpost.com, May 10, 2009. “Gordon Brown’s Free Fall,” The Wall Street Journal, May 8, 2009. “Davos Diary: When Hobnobbing Goes Wrong.” Harvard Business Blog Conversation Starter, February 2, 2009. “Davos Diary: Dismal Scientists, Irrational Statesmen.” Harvard Business Blog Conversation Starter, January 30, 2009. “Global Leadership, A Reality Lost and Not Found.” The Daily Star. February 20, 2009. “The Multi-Polar Myth.” Daily Times. February 19, 2009. “Will Global Economic Downturn Hit China Too?” RealClearPolitics, February 20, 2009. “In Cyberspace, China’s People Find Their Voice” for Real Clear Politics on June 25, 2008. “Imagining a McCain or Obama Presidency,” RealClearPolitics, June 4, 2008. “The Return of State Capitalism,” Survival. vol. 50, no. 3, June 2008. 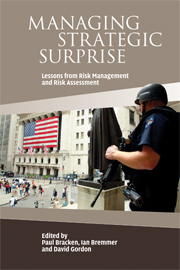 “Beijing’s Risky Games,” in The Analyst, (Toronto CFA Society), June 2008. “Africa’s Frontier Markets,” for the Daily Times (Pakistan), April 17, 2008. "The Turmoil Olympics," realclearpolitics.com, April 13, 2008. "Don't Look for Change Quite Yet,"International Herald Tribune, March 5, 2008. "Invasive Procedures,"The National Interest, February 29, 2008. "Adios Comondante: How did Fidel Castro Stay in Power for So Long? "Slate, February 19, 2008. “Impressions from Davos,” for National Interest online on January 29, 2008 and blogged from Davos for ft.com. Announced Eurasia Group’s annual list of Top Risks on January 7, 2008. "Hugo Chavez's Most Dangerous Enemy? It's Chavez Himself," on The Huffingtonpost.com November 14, 2007. Too Much Success? International Herald Tribune. October 19, 2007. “The twilight nears for Pakistan’s Pervez Musharraf,” The Daily Star, Sep. 11, 2007. “Zimbabwe’s Ruined Economy Signals End for Mugabe,” realclearpolitics.com, Aug. 7, 2007. "Who's in Charge in the Kremlin?" World Policy Journal, Vol. 22, No. 4, 2005/06. "The Saudi Paradox," World Policy Journal, Vol. 21, No. 3, 2004. "The Russian Roller Coaster," World Policy Journal, Vol. 20, No. 4, 2003/04. "Bush and Putin's Tentative Embrace," with Alexander Zaslavsky.World Policy Journal, Vol. 18, No. 4, 2001/02. "Russia's Total Security," World Policy Journal, Vol. 16, No. 2, 1999. "Oil Politics: America and the Riches of the Caspian Basin," World Policy Journal, Vol. 15, No. 1, 1998. Interviewed by Emil Sanamyan, “Ian Bremmer: No War Over NK, Same Challenges for Genocide Resolution,”The Armenian Reporter, February 12, 2009. Interviewed by Barrett Sheridan in “The Disasters Ahead: What Happens if Russia’s and China’s Economies and Governments Lose Their Footing?” Newsweek, February 11, 2009. Quoted by Michael Stott in, “Crisis Draws Dwindling Band of Russia Bulls,” Reuters, February 5, 2009. Interviewed by Andrew Marshall in, “Global Crisis Politics- A Davos Debate With Nouriel Roubini and Ian Bremmer,”Reuters, January 28, 2009. Quoted in “Raining on Beijing’s Parade Carries Risks for West,” Forbes.com, August 7, 2008. Quoted in “WTO 9th round: Doomed to failure?” in Pakistan’s Daily Mail, on July 25, 2008. Quoted in "Inside the Oil Markets" by CNBC on July 1, 2008. TEDx Oxford talk, March 2013. Video. Spoke at the CFO Day – Annual Conference for Financial Exchange, June 11-12, 2008. Keynote speaker at Major Business Forum, January 17, 2008 in Grand Cayman. Spoke at the World Alternative Investment Summit, Montreal Canada, Nov. 5-7, 2007. Authors@Google welcomed Ian Bremmer to the NY office on May 4, 2007. Video. Was invited to speak by the Chicago Council on Global Affairs to speak on current political and economic issues at the Chicago Club, September 13, 2006.